Airways Hotel Victoria London i London, England: Reservér nu! 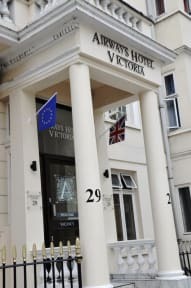 Airways Hotel is a 3 star budget accommodation hotel located in the heart of London, within easy access to all major London Tourist attractions Big Ben, House of Parliament, Tate Gallery, Buckingham Palace are all within a 30 min walking distance. All the main attractions of the city are within easy reach; a short walk to the Kings Road, the Chelsea Flower Show, and the Hard Rock Caf while access to all of London is a piece of cake through Victoria Rail, Tube and Coach Station and the Gatwick Express Terminal at Victoria. The hotel has 40 en suite bedrooms; all rooms are equipped with TV, direct dial telephone, fridge and free tea- coffee making facilities. We can organize, upon request, airport drop-off service and City Tour of London tickets. We serve Continental as well as Full English breakfast at the hotel. The Airways Hotel is just a 5 minutes walk to the River Thames with its fantastic views and river-boat restaurants, also nearby you can find the famous traditional English Pubs serving delicious pub hot meals. 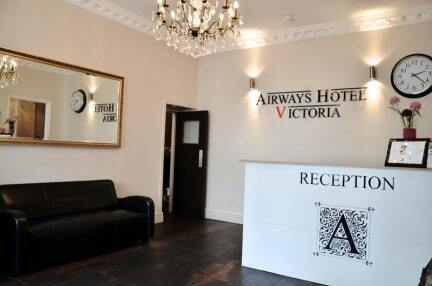 Airways Hotel can book upon request tickets for the local theatres: Victoria Palace Theatre and The Apollo Theatre, also within walking distance. For those who like shopping, Airways Hotel is near Victoria Street with its new Shopping Centre complex plus Army & Navy Department Stores.